Turkey’s main opposition leader launched a European court appeal today (4 July) over an April vote that granted President Recep Tayyip Erdoğan sweeping powers, stepping up his challenge to the government as he leads a 425 kilometre (265 mile) protest march. 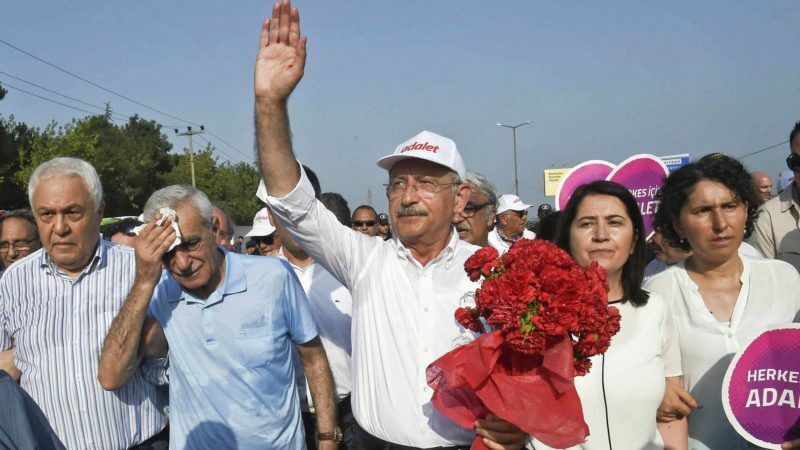 Before starting the 20th day of his march, CHP head Kemal Kılıçdaroğlu signed an appeal to the European Court of Human Rights against the decision by Turkey’s YSK election board to accept unstamped ballots in the 16 April referendum. “The YSK decision made the referendum illegitimate. We are applying to the European Court of Human Rights,” Kılıçdaroğlu told reporters in the city of Izmit, around 100 km (62 miles) east of central Istanbul. Kılıçdaroğlu, 68, set out for Istanbul from the capital Ankara on 15 June a 425-km march, after fellow CHP deputy Enis Berberoğlu was jailed for 25 years for spying, becoming the first MP from the party to be imprisoned in a government crackdown following a failed coup in July 2016. April’s referendum, held under a state of emergency, gave a narrow 51.4% approval for constitutional changes that sharply widened Erdoğan’s presidential authority. Opposition parties have said the poll was deeply flawed, while European election observers said the decision of the High Electoral Board (YSK) to allow unstamped ballot papers to be counted had removed a main safeguard against voting fraud. Some 160 journalists are imprisoned in Turkey, according to the journalists union, and authorities have shut down 130 media outlets since the failed coup. The march is expected to last around 25 days, with participants walking some 16-20 km daily. Today, on day 20, 100 km are left to go to Istanbul.